Created with india ink and tradtional bamboo sumi-e brushes, this sketch of Oceanside Oregon rocks with a seagull was a fun experiment. 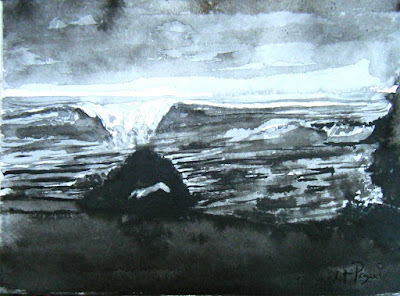 Having studied Sumi-e, I had been meaning to use those skills for something new and different. This sketch is 9" x 12" on Strathmore watercolor paper. I'm reading: India Ink Sumi-Style Sketch, Oceanside and SeagullTweet this!